Water wells must be located and constructed to provide safe water at all times and under all conditions. The purpose of this publication is to describe approved methods for the construction of drilled wells. Appropriate location of the well reduces the possibility of contamination. The ideal well location has good drainage and is higher than the surrounding ground surface. All possible sources of contamination should be at a lower elevation than the well, and the distances to those contamination sources must be in accordance with the Illinois Water Well Construction Code (IWWCC). Surface drainage should not allow surface water to accumulate within a 15-foot radius of the well. A well should be at least 10 feet from sewers and 50 feet from septic tanks, or 75 feet from sewage seepage fields. 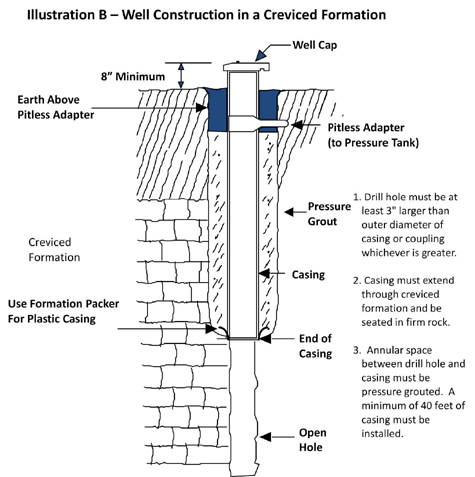 An approved well cap or seal shall be installed at the top of the well casing to prevent any contamination from entering the well at the surface. A well vent is required. The well vent pipe shall be at least ½ inch in diameter, 8 inches above the finished grade, and be turned down, with the opening screened with a minimum 24-mesh durable screen to prevent entry of insects. Only approved well casing material meeting the requirements of the IWWCC may be utilized. To prevent contamination, the annular space between the drill hole and the well casing shall be grouted below the pitless adapter or unit in accordance with the IWWCC. All water well pumps shall be installed in accordance with the Illinois Water Well Pump Installation Code. If the pump is located away from the well, the buried pipe leading to the pump from the well shall be encased in another pipe maintained at system pressure. A down-turned smooth nose sampling faucet shall be installed, not less than 18 inches above the floor, in a convenient location between the water well and the pressure tank or as near to the well as possible. New drilled wells shall not be located in pits. The well casing shall terminate at least 8 inches above ground level. Frost protection should be provided by use of an insulated pump house or an approved pitless adapter. Jet, reciprocating, deep well turbine, and submersible pumps are all approved. All suction, pressure, vent, and electric lines shall enter the top of the casing through a watertight seal. Hand pumps equipped with a packing gland around the pump rod; an enclosed, turned-down spout; and a bell-type, one piece base made as a part of the pump stand or attached to the pump column in a watertight manner are approved. Pumps and pressure tanks may be located in basements. All wells, however, must be located outside of basement walls. Existing well pits that are not structurally sound and watertight or do not have well casing that extends at least 12 inches above the pit floor should be eliminated. Breaking or removing the floor or one wall of the pit accomplishes this task. 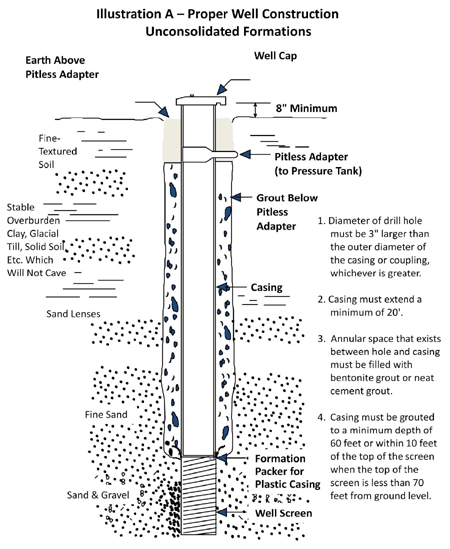 The well casing must be extended to at least 8 inches above the finished grade. Fill in the pit with compacted earth. If the pump discharge line exits the top of the well, a well seal and insulated pump house are necessary. If the pump discharge line passes through the well casing underground, an approved pitless adapter shall be installed. Rehabilitation, reconstruction or repair of wells shall be done in compliance with the IWWCC. A new, cleaned, or a repaired well normally contains contamination that may remain for weeks unless the well is thoroughly disinfected. This may be accomplished by the use of ordinary laundry bleach in a solution concentration of 100 parts per million (ppm) of chlorine. The amount of bleach required is determined by the amount of water in the well. When working with chlorine, you should always be in an open or well-ventilated place. Do not allow the strong liquid to remain in contact with the skin or clothing. Solutions are best handled in plastic containers since strong chlorine solutions corrode metal containers. The amount of laundry bleach (5.25% chlorine) required for each 100 gallons of water equals 3 cups. One cup equals 8 ounces, 2 cups equal 1 pint, and 4 cups equal 1 quart. Using the table below, determine the amount of water in your well by multiplying the gallons per foot by the number of feet of water in the well. (Considering the well is full of water will be satisfactory in most cases, as a slight overdose does no harm.) For example, a 6-inch diameter well that is 300 feet deep contains 450 gallons of water (300 ft. x 1.5 gallons/ft. = 450 gallons). Each 100 gallons of water in the well requires 3 cups of laundry bleach. Using the same example, a well containing 450 gallons of water requires 13.5 cups (450 gallons/100 gallons x 3 cups = 13.5 cups) or about 1 gallon of liquid laundry bleach. Mix this total amount in about 10 gallons of water and stir thoroughly. Remove the well cap and pour this solution into the top of the well between the casing and the drop pipe. Connect one or more hoses from faucets on the discharge side of the pressure tank to the top of the well casing and start the pump, recirculating the water back into the well for at least 15 minutes. Then open each faucet in the system until a chlorine smell is noticeable. Close all faucets. Rinse chlorine solution off any wires and the pitless adapter in well casing. Seal the top of the casing with a sanitary well seal and let stand for several hours, preferably overnight. After standing, operate the pump, and discharge water from all outlets until all chlorine odor disappears. After several days use, submit a sample of the water to a laboratory for analysis. Always regard wells obtaining water from creviced formations such as cracked limestone or dolomite with caution. Contaminated water can move rapidly through these types of formations. Therefore, proper well location and construction are very important when drilling wells in these types of formations. When the earth mantle overlying the upper bedrock formation is less than 30 feet thick, the well casing shall extend to a depth of at least 40 feet below ground level. The annular space between the bore hole and the well casing shall be pressure grouted. Where the well is drilled to obtain water from a formation located below a creviced formation, the casing shall extend at least through the creviced formation and be seated in firm rock. When an outer casing is left in place, the annular space between the casings shall be pressure grouted and the annular opening around the outer casing shall be grouted with bentonite grout or neat cement grout. Where the earth mantle overlying the upper bedrock formation is greater than 30 feet thick, the casing shall be fitted with a drive shoe and driven to a firm seat in the limestone or dolomite. The annular space around the casing shall be sealed with bentonite grout or neat cement grout. More detailed information can be found in the Illinois Water Well Construction Code, available on the Internet at http://www.ilga.gov/commission/jcar/admincode/077/07700920sections.html . A hard copy can be obtained from your local health department or from one of the regional offices listed below.